Well, the time has come. We are now accepting preorders on Longclaw! Now now, obviously the order functionality is new, this is our first product, so if you notice any bugs or oddities, please contact us. Also, all pictures are of the prototype and they may change slightly, depending on feedback with them. So Order Now. Please read all the information on the product page before ordering, lots of important stuff there. Alright! Just placed my preorder, printed out my little sheet and will be sending it w/ a personal check tommorow. . . Thanks a ton folks, i hope to be admiring your handy-work soon! Ordered mine, let me know when I can come pick it up! As soon as I get the green light from the misses I’ll be ordering one up too! I’m gonna have to beg on this one lol. Order form printed, check will be in the mail ASAP! Thanks so much for doing this, guys… this is something I’m so excited to be able to own (and am looking forward to the rest too). Hmm… the pommel looks a bit plasticy, but that’s cool. As soon as I get $260, I’ll be getting one of these. Mom’s a bit low on money, and as a 16 year old with no job experience and school starting soon, this is going to take a while. Hopefully they aren’t sold out by the end of September. Yikes! Very discouraging to see acrylic garnets as if the real thing would cost that much more. Pommel head does look plastic poor quality. It should have been the most significant detailed part. Silver would have been like 20 bucks for that amount. If you expect us to value a heirloom type quality sword as depicted in the series then try to make it as such. Otherwise make it out of plastic or resin and sell it cheap. No offense, but your understanding of sword mass production is limited. We may one day produce every more limited high end versions with actual gemstones, precious metals, and high carbon steel, for a price point of around $1000 each, but the goal here is to be accessible to the most possible collectors. The pommel, by the books, is white stone. You cannot mass produce carved stone like that, so the only option was to use powder coated metal with an antiquing paint wash finish, which we did use, and which was approved by Mr. Martin. It would make no sense to make it out of silver. Silver isn’t white, it is silver, so it’d be less accurate. And why use a precious metal if you were just going to cover it in white? Plus, we’re at the Wall here. We went through numerous design revisions with GRRM and one concept he kept mentioning was that Donal Noyle would not have the resources to make something fancy and so we kept making more and more simplistic hilt designs. Where did Donal Noyle get the silver from? Melted down the Old Bear’s flatware? For a technical standpoint we’d also have to be concerned with the metal’s characteristics, such as weight, a big glob of a heavier metal like silver at the pommel would change the weight and balance of the blade. Same reason with resin, a pommel exists to balance against the weight of the blade, making one out of resin is going to result in poor balance. Not that we’d ever want to release a sword with so much resin on it. As for using real garnets, it may seem easy to find two for the eyes of one sword, but what you’d need is a reliable source of 5000 identically colored and cut garnets at a price that isn’t going to push the retail price of the sword beyond the reach of the average collector. Believe me, we’re fans of the series, and our goal is to produce the best possible swords, and to work with Mr. Martin as closely as possible to make sure the swords match his vision, but there are certain things, such as the availability and economics of materials, and perhaps most importantly the technical requirements of designing a solid sword, that influence choices. Ordered! The cheque will be in the post shortly. I don’t know about the others, but I’m still very impressed with what I see. It definitely exceeded my expectations, at least. A picture can only tell us so much, guys. Really interested in the sword but the $350 postage to Australia, which is more then the cost of the sword is making it a hard sell. Is it possible to bundle multiple swords together to reduce the price of shipping to Australia? Yes, Dragokahn, see the previous blog post. don’t let crap from people like Dirk mislead you. This looks fracking amazing and the attention to detail and having George involved in the design process means so much to the fans. When I saw needle I was so impressed ebcause it looked NOTHING like I thought it would. Your description and George’s input made perfect sense to me and now I intend to think of these blades whenever I read the series! I hope if the HBO series is greenlit, they have enough sense to get you involved when it comes time to get the swords for the show. I will be sending you my pre order form very soon! any idea about what swords will come after needle then? @ internet user: They stated that they’re making Needle next, and then Ice. The more I keep looking at the picture, the more I want the blade! Q4 can’t come fast enough! Although I’v never posted before, Iv been keeping an eye on the site for months in anticipation for the release of Longclaw. While I am definately going to be ordering one, I thought I’d throw in my opinion, along with the others. That said, I thought that if there was a cap/ring seperating the leather of the grip and the pommel, it might make it look a little more acurate. I just find that the white of the pommel needs some space before the leather starts. Like if there was a 1cm spacer between the grip and the “neck” of the wolfs head. I dont think I was very clear, but does anyone understand what I mean? I think the sword looks fantastic, Valyrian Steel folk. A closer look at just the image of the pommel makes it clear it’s not plastic, that instead it looks like a powder coating. I’m sure it looks fantastic. I can’t imagine trying to balance a beautiful item with the cost ceiling you’re all trying to hit, and know that most of us really appreciate the product just by sight alone and can’t wait to get one or more of these swrods. I understand you Garrick, but we went through about 16 different hilt designs with GRRM, and some of the others did have fancier transitions, but he kept having us simplify it. Remember, the hilt of this blade was made at the Wall in extreme conditions by a retired smith with meager resources. When we make Oathkeeper, believe me, you’ll see fancy, Lannister gold goes a long way to prettying up a sword. Ice, it isn’t plastic at all, the pommel is very substantial, weighty, and has the feel of metal. Those who think it looks like cheap plastic will change their minds when they see a copy in person. 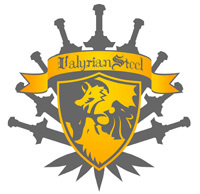 Valyrian, that makes sense, and I just want to say great job on the sword, and forgive me for stating something that you guys obviously went over repeatedly in teh process of the sword. Although I wasnt expecting much when I heard you guys were going to do Needle next, when I saw the image you guys were working on for the prototype, I was absolutely floored; its simply stunning. Simple, elegant and beautiful. Keep up the great work! Yes, credit card sales will eventually be turned on. For sure when the shipment comes in, but likely before. There are just various regulations with Visa & Mastercard about accepting payment for something you aren’t going to ship right away, and this way we avoid having to deal with those. However, some countries, Russia, China, Malaysia, Nigeria, etc will have to continue to pay with a check or money order as credit card sales from those countries are frequently made with stolen cards, and I mean really frequently. A question for some post order operation… will we be receiving confirmation of receipt for our checks/money orders when you guys get them? Such as an email letting us know it got there ok…. just want to make sure my check gets there safe so I can be sure to get Longclaw in hand. K, I got some small questions like how long is longclaw with halt and blade together? How much does it weigh? The blade in the picture is real o drawn? It seem to… plain, and the texture is specular, is so unreal. We are able to see a photo of the finished sword before the shipping? Or maybe the final result of the texturing on the blade? Martino, That is a picture, seriously. Cool looking huh? The blade texture is achieved by putting an acid blocker on it in a reverse pattern, giving it a very brief acid bath, and then polishing it. Bones, yes, you’ll get an email. iordsnow, 50 inches, and around 11 or 12 pounds. The shipping weight is 14 but that includes packaging and the plaque. While I know this is not a “battle-ready” sword, does it have full tang? I think that the hilt design if fantastic. However, I am rereading the books again and i thought that longclaw had a slight curve somewhat like a katana? I didn’t mean to get you riled up, Valyrian, it’s just that when I looked at the pictures on the site, the side one of the pommel looked a tad plasticy. But plastic or not, it looks all kinds of bitchin’, and I really need a job so I can get me one of these things and hang it up in my room. Do you have plans for any sort of display, or a scabbard? it comes with a wall mount display plaque with the Stark crest (in reverse) and motto. Im also curious as to if this is full tang? also how sharp is the blade? Not that it matters but it’d be nice if it was even a little sharp. Thank you. It isn’t full tang, the tang goes half way and then is welded to a threaded rod for pommel attachment, so-called rat-tail tang. It isn’t going to be sharp, this is for a variety of reasons, not the least of which is making sure it can get into some countries. The consumer can choose to have it sharpened by someone after they receive it, that is their perogative. In the end remember, this sword is meant for display, whether that be on a wall or on a belt, but not for reenactments or mock-combat. If you and your buddy go out and start banging your swords together you are likely to damage them (even if they were both really high end high carbon steel swords you start banging them together you’ll get damage). So I’m looking at my order and it says Ground shipping (local pickup). I live in Michigan but I payed $20 so that I wouldn’t have to drive out to Lansing. But the wording on my order is confusing me. Am I going to have to drive out to Lansing anyway? if you paid the $20 for shipping it’ll be shipped. You guys need to quit complaining….These swords took 12 years to make! It is what it is. amazingly well done, I’ll preorder the moment I have the money. Please let me know if you ever make a replica of Heartsbane. I preordered awhile ago and I was looking at the pictures and just doing some rough guesstimates on dimensions not mentioned. Am I imagining things or is there only 4.75inches/12cm of leather for the grip? I do hope there is more than that. Im also thinking the handle is around 9″/23cm wide. Are these guesses correct assuming handle length is 11″? No. That isn’t correct. It is a hand and a half sword, so by definition there is enough grip for two hands. Just over 6 inches of leather grip, another inch or so in wolf neck. Longclaw is just a beautiful sword; the attention to story background (can’t be too ornate due to Wall conditions and their short supply of suitable materials, etc.) makes Westeros come to life in a whole new way! True fans should be so pleased. Congratulations on an excellent product! Great work all you at VS!!! Before I send my m.o., I wanted to make sure- I don’t have a printer at the moment but I wrote out everything like the order form nice and neat, including all necessary info- Is this okay? And can’t wait for Needle and Ice! Nothing we sell comes sharp.